A Chanel-style jacket is a powerful piece that has stood the test of time, and 70 years later there are no age restrictions to its wearability. 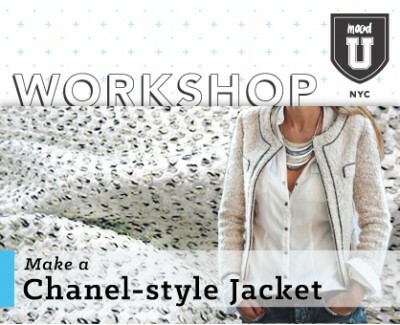 A well-made Chanel-style jacket is a great investment in your wardrobe because of its versatility — you can dress it up, or dress it down, and you’ll always have a classic look. The best kept secret of all is that it’s a perfect first-time jacket project because it’s really not that difficult to make! You will need a medium weight bouclé fabric or something similar for this project. You could also try something less traditional, but make sure you stick with a no-stretch, woven fabric. If you visit Mood Fabrics and speak to the sales associates they can also recommend options. We suggest doing this ahead of your workshop date if possible. We suggest you take swatches of a few options - we will allocate time in the morning of the workshop to purchase your final choice of fabric, lining and notions. In the workshop introduction we will determine what size jacket you will be making and this will influence how many yards of fabric will be required. You are welcome to email us at info@moodu.com with any specific questions about fabric yardage prior to your workshop.